Apple ID Disabled? Fix It Fast! Having a working Apple ID is essential to using your iPhone (or really any Apple device, actually), so your Apple ID being disabled is a real problem. In that situation, you won't be able to do things like buy apps from the App Store or update your Apple ID billing or subscription information. A disabled Apple ID might seem like a big problem, but it's actually pretty easy to fix. "This Apple ID has been locked for security reasons." 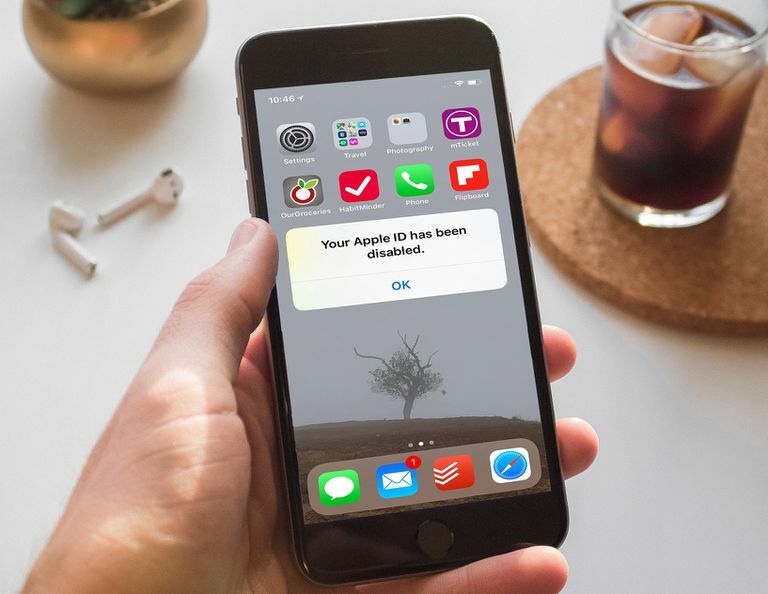 If you see any of these alerts, you can be sure your Apple ID is disabled. At this point, the biggest question, of course, is why is your Apple ID disabled? There's basically one answer: for your security. Apple automatically disables Apple IDs when someone tries to log into them too many times using the wrong password, security questions, or other account information. This could happen just because you're forgetful or you accidentally type the wrong password too many times. More likely, though, someone is trying to gain unauthorized access to your Apple ID. A standard hacking technique is to try logging into an account with all kinds of guesses for things like passwords. Rather than allow that to happen, and potentially put your account at risk, Apple disables the Apple ID account that may be getting hacked after a few incorrect entries. Then, only the user who really owns the account and knows the right information can re-activate it. When your Apple ID is disabled, you can't log in – even with the correct password – until you re-enable the account. Try logging into your account using your Apple ID username (email address) and the correct password. If this doesn't work, or if you don't remember your password, you can choose to reset your Apple ID password. Whichever option you choose, follow the onscreen prompts to unlock your account or reset your password. For full, detailed, step-by-step instructions on how to reset your Apple ID, check out How to Reset Your Apple ID Password in a Few Easy Steps. This article also covers resetting your account if you use Two-Factor Authentication, a technique discussed in the next section. Some people prefer to add additional security to their accounts by using Two-Factor Authentication with their Apple ID. With this approach, you can only access your Apple ID if you have both your username and password and a randomly generated code supplied by Apple when you try to log in. In that case, the process of fixing your disabled Apple ID is pretty similar. The only difference is that you need access to one of the trusted devices you designated when you set up Two-Factor Authentication originally. Apple will send the random code to that device during the process of unlocking or resetting your Apple ID. If you re-enabled your Apple ID by changing your password, you'll probably need to log in to your Apple ID using your new password on all of your devices, including in iCloud, FaceTime, and elsewhere. If you followed the instructions to either log back into your Apple ID, or to reset your Apple ID password, and your Apple ID still isn't enabled, you should contact Apple for support. You can either head to your local Apple Store for in-person support (but make sure to make an appointment in advance) or you can get online support from Apple.